Colorful socks are in trend. 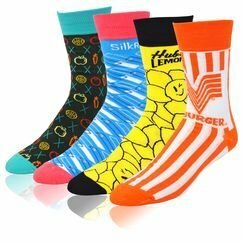 Make custom socks using your logo and message. Base Price Includes: One pair of one size fits all socks with woven-in, jacquard design up to 3 PMS colors, 6 colors total, and bulk packaging.